After years of battling Goutweed in our front garden, I decided to take drastic measures to get rid of it once and for all. The tactic I decided to use? I smothered it! That sounds rather vicious, but in reality, it was more work than anything else. 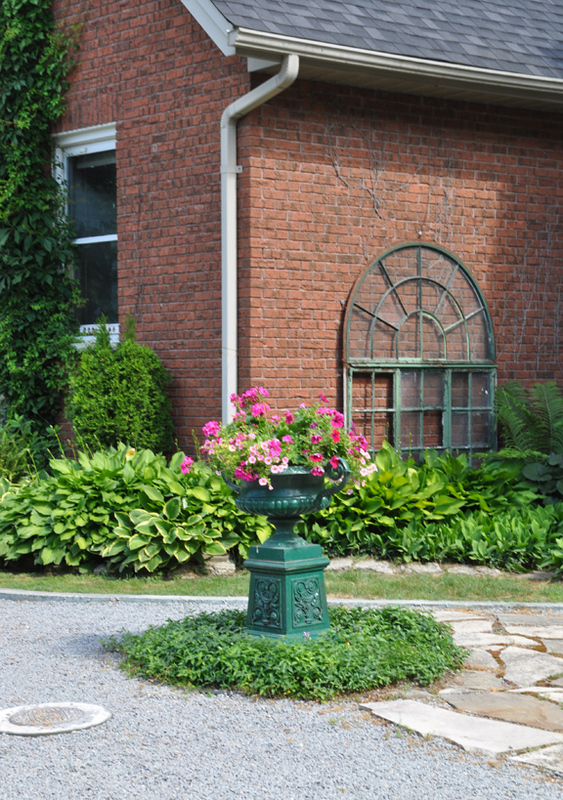 • Clear the area removing all the perennials and any small shrubs. Trees obviously have to remain as do large shrubs. Aggressive plants will sometimes shoot their roots right through those of other perennials. It's therefore necessary to lift each plant, wash the roots and inspect the root ball carefully. The root ball may need to be divided into smaller pieces to eliminate problems. 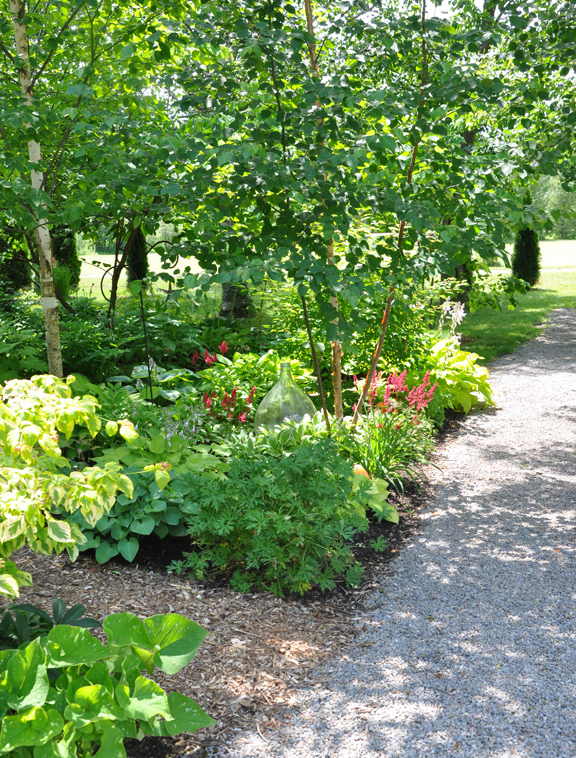 Once the lifted perennials are completely cleared of invaders, you can replant them in another spot. Just be extremely careful with this step. 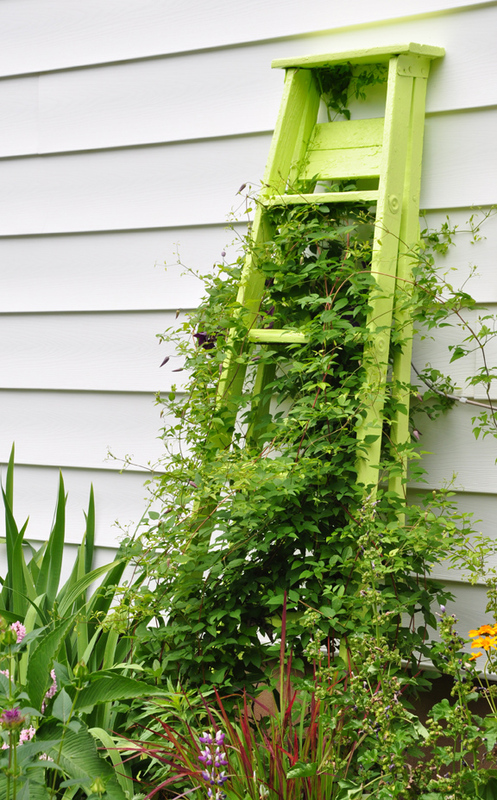 The last thing you want to do is transfer an invasive plant to another area of the garden. It's hard to show, but in the picture above you can somewhat see that orange daylilies have infiltrated a clump of hosta. The only way to separate the two plants is to dig up the clump of hosta. Then you need to clear enough dirt from the roots to see what's going on. 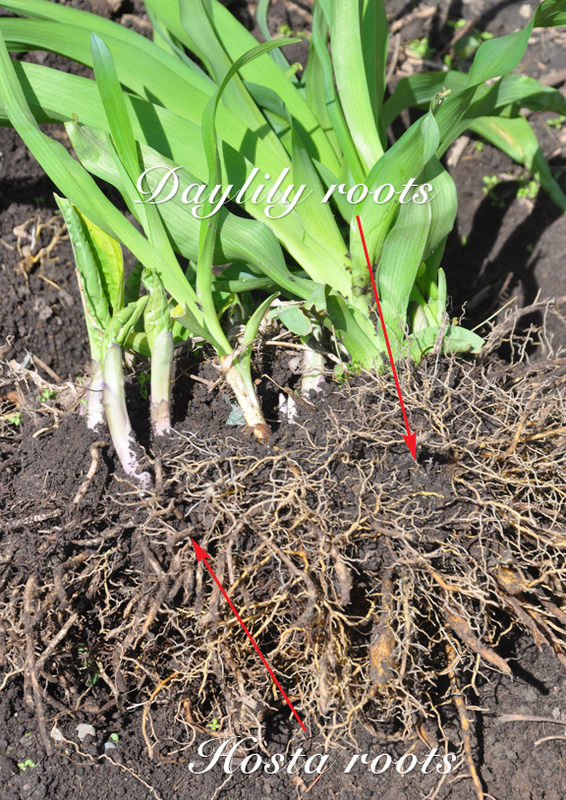 Once you identify the two types of roots, you can carefully separate the two plants. 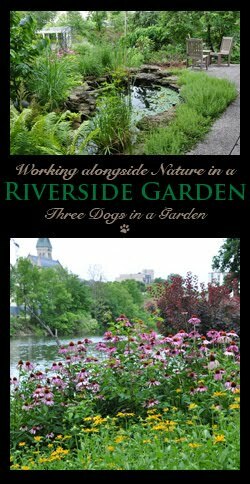 • Once the flowerbed is completely cleared and the perennials you want to keep have been set aside, go back and remove all the invasive plant roots you can find. Again, do this very carefully. Often any remaining root segments have the potential to produce new plants. It's best to dig back over an area two or three times to insure you have removed as many of the invasive roots as possible. • To make it difficult for any missed root segments to regrow, you want to create a light barrier. I just happen to have President's Choice compost bags on hand, but any brown compost bag will do. 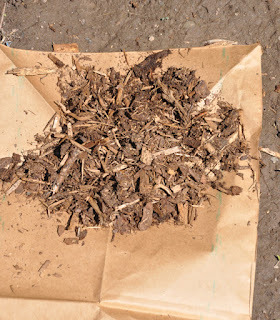 • To make a light barrier I decided to use brown paper compost bags and cut them up. Why compost bags? They are biodegradable and have less printer's ink than newsprint. 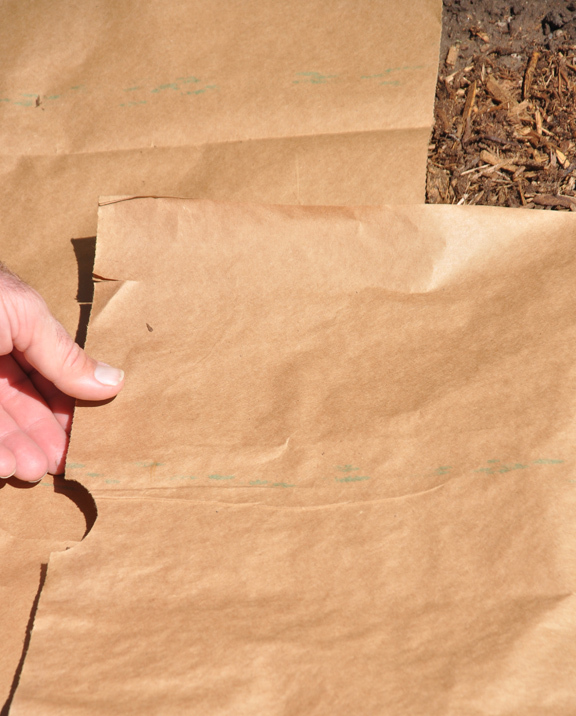 A compost bag when cut open also creates a big, solid piece of paper. That large piece of paper covers so much more ground than a open spread of newsprint would. You could use cardboard– it would work just fine, but you'll have to remove any tape or staples that hold the box together. These materials wouldn't break down and staples could pose a risk later on. 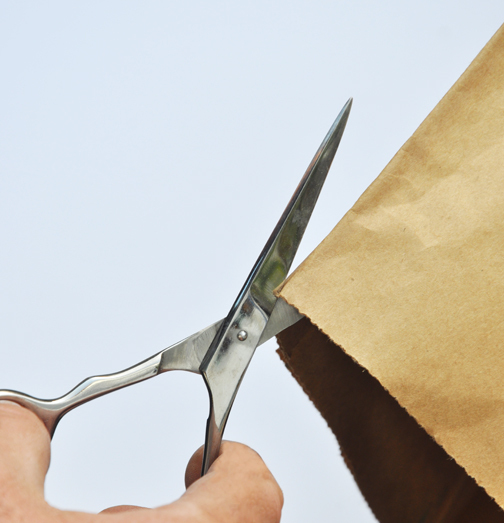 • With your scissors, cut along the outside corner of the brown paper bag all the way to the bottom. When you get to the bottom, turn the scissors and follow the bottom of the bag all the way around until you've cut off the whole bottom section of the bag. With the bottom cut away, you should now be able to open the compost bag into one big rectangle of heavy brown paper. Don't throw away the bottom of the bag! As you will see in a minute, it has a use. • Try to chose a windless day to avoid frustration with this next step. The goal is to cover the entire area with a solid barrier that will deprive light to any remaining roots. 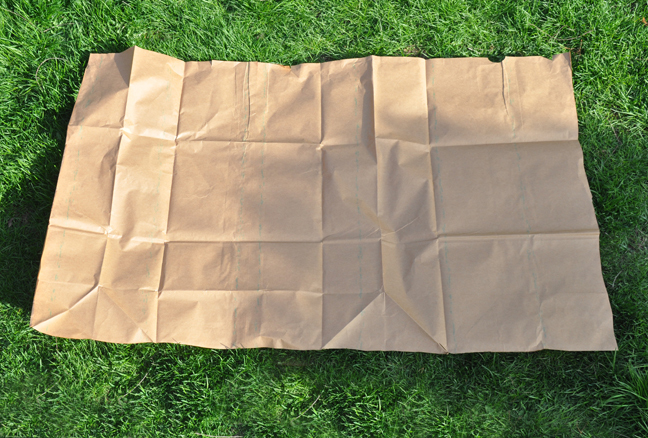 • Lay the open piece of brown paper on the ground. 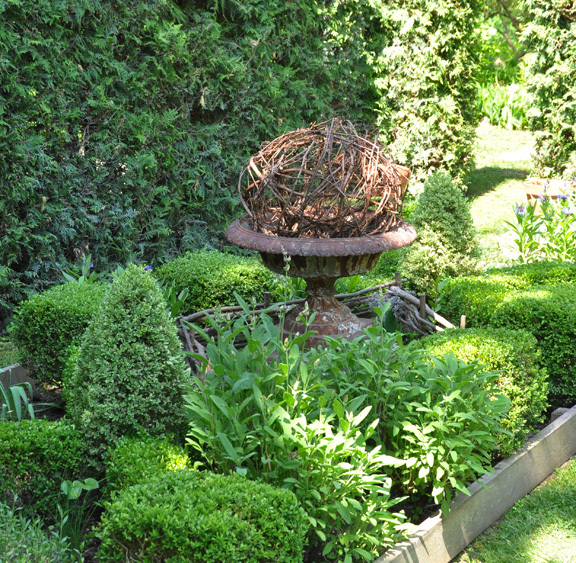 Use a small stone or a small pile of mulch in each corner to hold the paper in place while you work. I used a single layer of paper, but a double layer of brown paper would be even better. 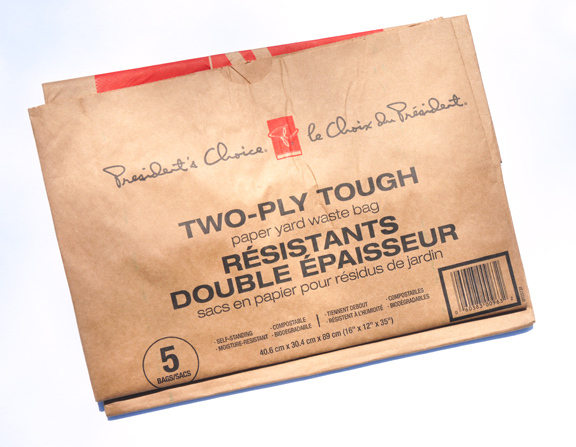 • Overlap the pieces of brown paper by at least six inches. If you leave gaps, light can reach through the gaps. Here is how I dealt with a small tree in the middle of my flowerbed. I cut the bottom section of the bag in half. Then I cut a U-shaped hole in the centre of each of the two pieces of brown paper. In the final step, I overlapped the two pieces together around the base of the tree. Once I had the tree surrounded with paper, I went back to using larger sections of paper. 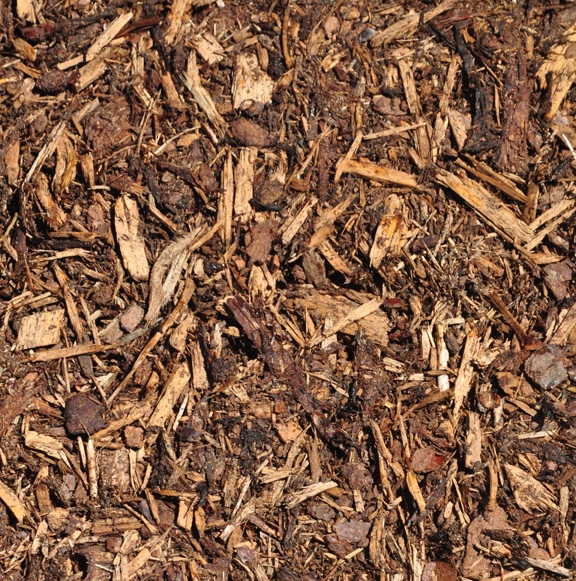 Once the paper is laid out on the ground, cover the whole area with natural cedar mulch. Don't be stingy! Make that layer of mulch at least 2-4 inches deep. The mulch will do a number of things. Along with the paper, it helps to block light. The weight of the mulch will deter fresh sprouts. It will also help keep the paper a bit dryer. And finally, the mulch will make the area look presentable while the paper does its work. Goutweed can really take over as it has done here in this garden. Gardening in this area is now on hold for a month or even more. If sprouts do make it through the paper and mulch, dig them out. 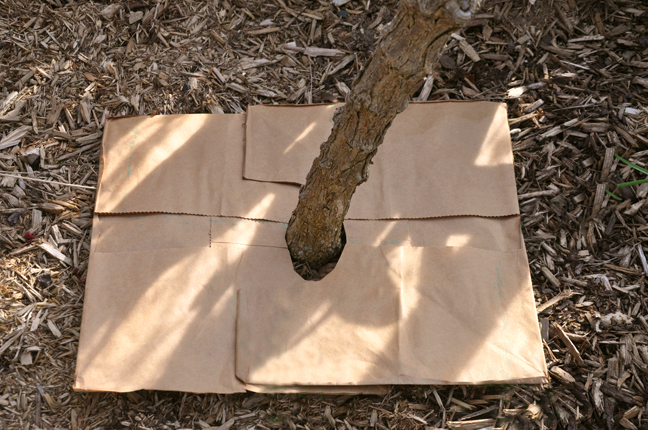 Create a new patch of brown paper to cover the hole. Add a fresh layer of mulch on top of the patch. 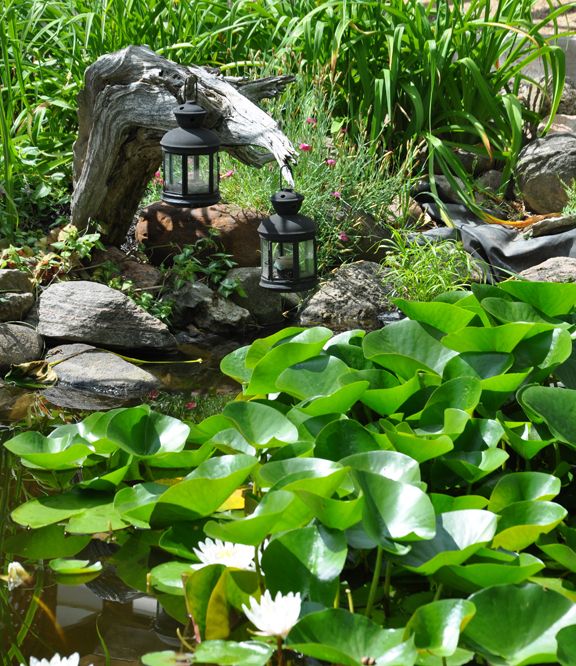 Creating a light barrier may not work for every invasive plant or in every garden situation. Large shrubs can be surrounded with paper much like trees, but extra vigilance is needed as invasive plants can hide out at the base of a shrub. If you deprive a plant of light in one area, it can travel to another. 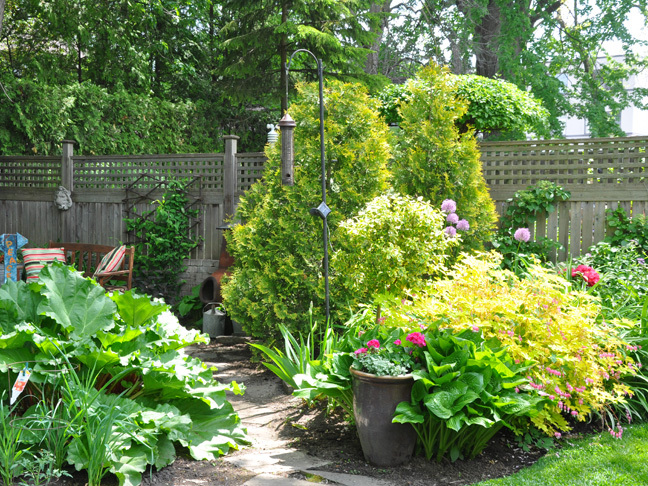 Should you decide to use my tactics, I would recommend you find a way to block the invasive plant in question from running into a new area of the garden. The easiest way to do this might be to dig a deep and wide trench around the problem space. This method has worked pretty well for me and it is organic. I did have a few shoots make it up through the paper, but I removed them and patched the holes. After about a month and a half, I didn't have any new signs of the dreaded Goutweed. My struggles are far from over. 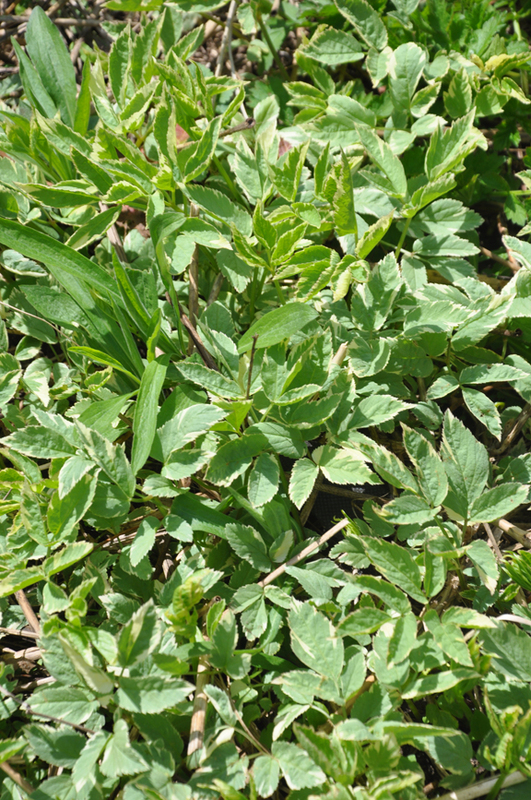 There is another patch of Goutweed in the backyard. Like housework, a gardener's work is never done! 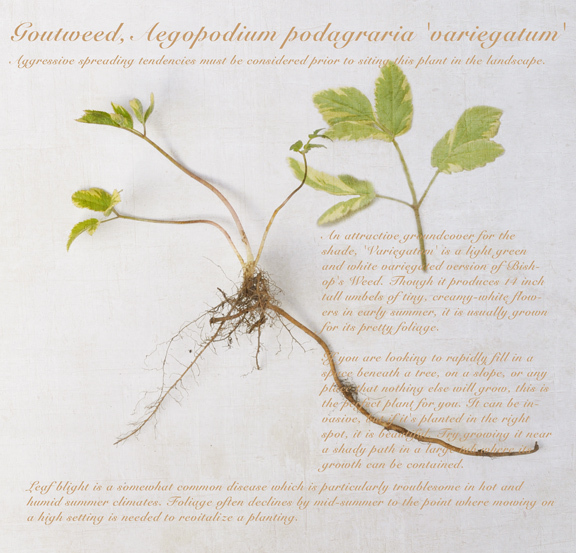 Go back and read Invasive Plants Part 1 and Part 2. Magic happens when perennials are planted together beautifully. 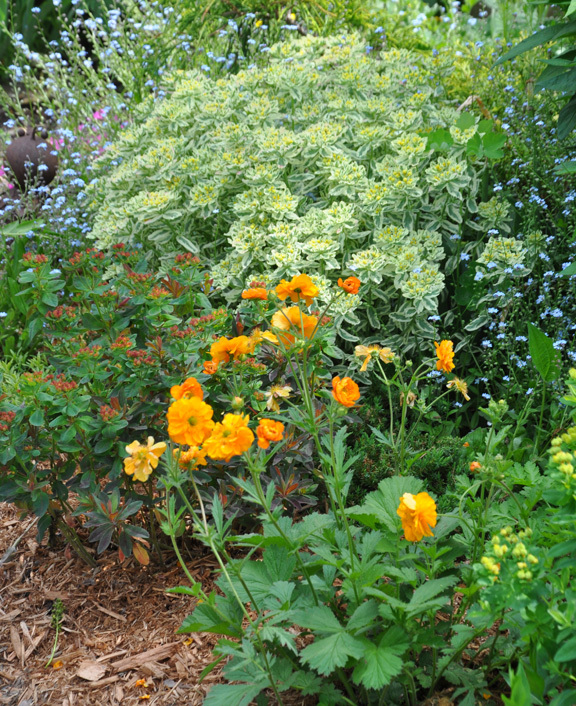 Experienced gardeners often become adept at creating pretty pairings, but even they will tell you that creating a nice mix of plants is often more a matter of trial and error than anything else. I think this is because there are so many potential considerations–color, texture, size, shape, and bloom time– that even instinct and experience are sometimes not enough. You just have to experiment and try things out. In this struggle to get it right, plants will sometimes become the unwitting participants in an elaborate game of musical chairs. There is no shame in moving plants around until your happy. 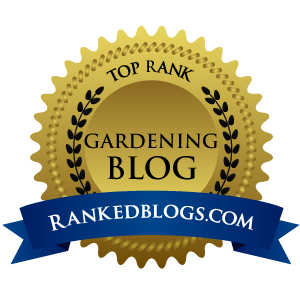 It's precisely this type of challenge that makes gardening fun and rewarding. It's exciting when something you've struggled to create looks just as nice as you hoped it would. 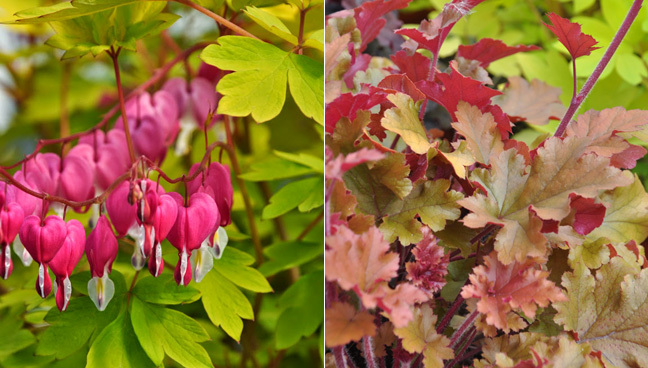 Todays post uses two great spring plants; Euphorbia Polychroma (full sun) and Bleeding Heart, Dicentra spectabilis (part-shade/shade) to demonstrate a few ways color can be used to match plants together. Design Trick: An analogous color scheme makes use of colors that are next to one another on the color wheel. Blue sits next to green and green is right beside yellow. White simply adds freshness to the mix. 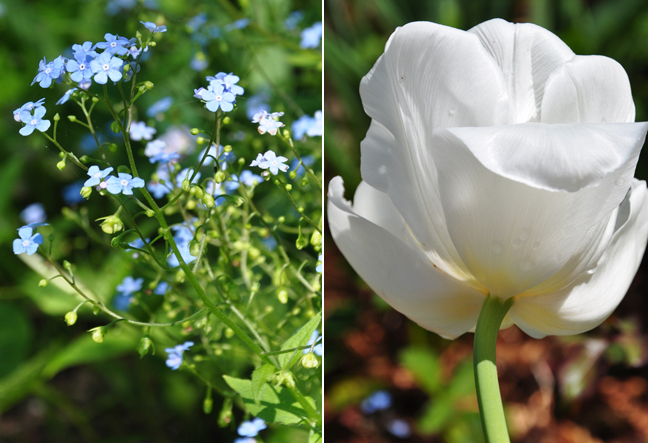 The plant pairing: Cushion Spurge, Euphorbia Polychroma + Forget-me-nots + White tulips (or late daffodils/narcissus). 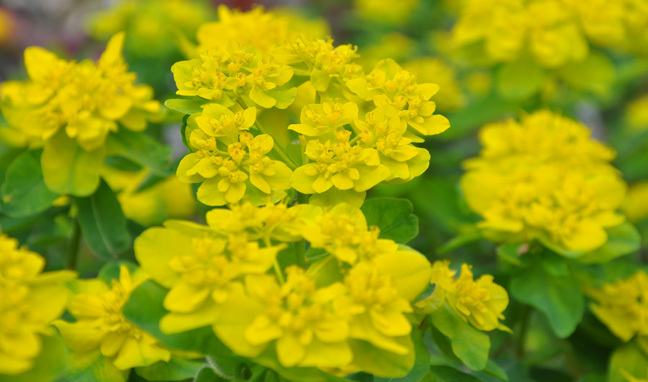 Cushion Spurge, Euphorbia Polychroma: prefers full sun and somewhat dry conditions. Normal or sandy soil is best. 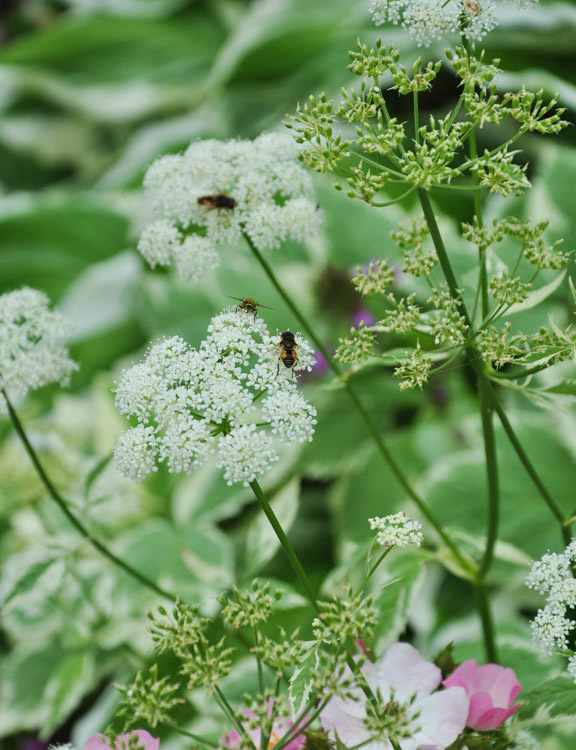 Cut Euphorbia Polychroma back in early summer to keep it neat and compact, but be careful to wear garden gloves as the milky-white sap the plant extrudes can be irritating to skin. Height: 30-45 cm (12-18 inches), Spread: 45-60 cm (18-23 inches). USDA Zones: 3-9. Forget-me-not, Myosotis alpestris is a compact plant that reseeds itself with abandon. This biennial likes light shade, but I find it will grow just about anywhere. Mid-spring, when the plant finishes flowering, I pull out most of my Forget-me-nots and leave just a few to reseed. This may sound like a lot of work, but you can't beat Forget-me-nots as an understory for spring bulbs and flowers. Start with a cheap packet of seed and you'll have Forget-me-nots forever! 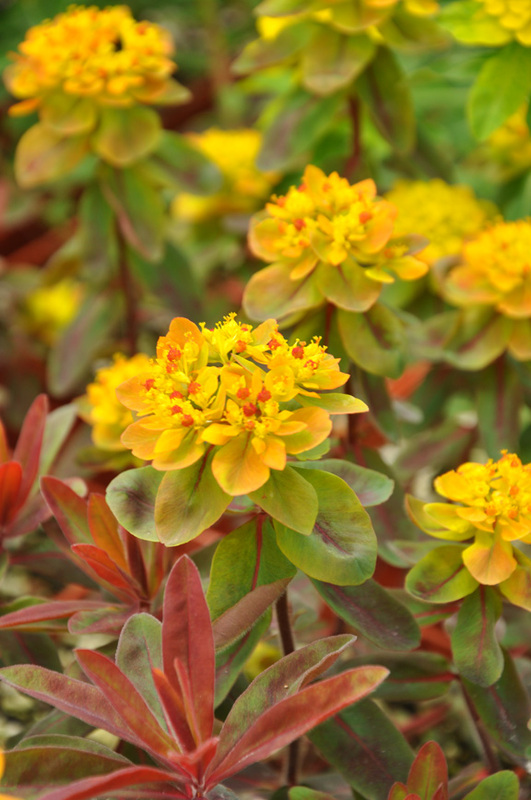 In this variation, which again uses a type of Euphorbia, two closely related colors (reddish-orange and apricot) sit comfortably beside one another. 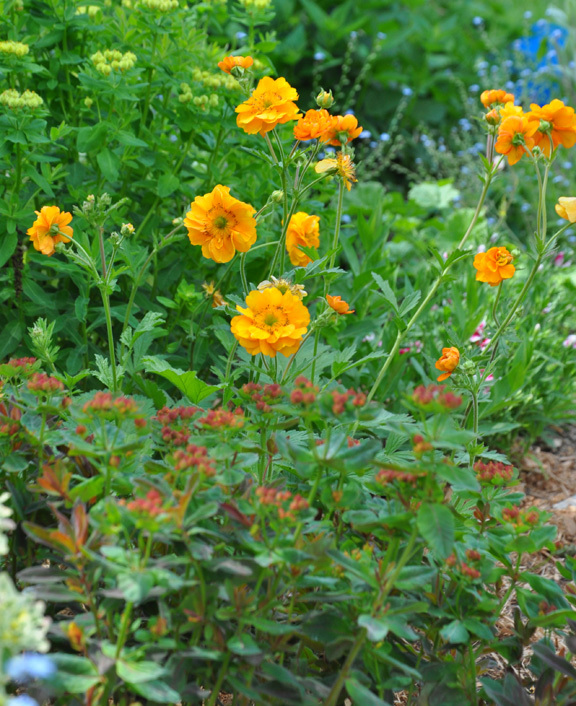 The plant pairing: Euphorbia polychroma 'Bonfire'+ Geum 'Mai Tai'. 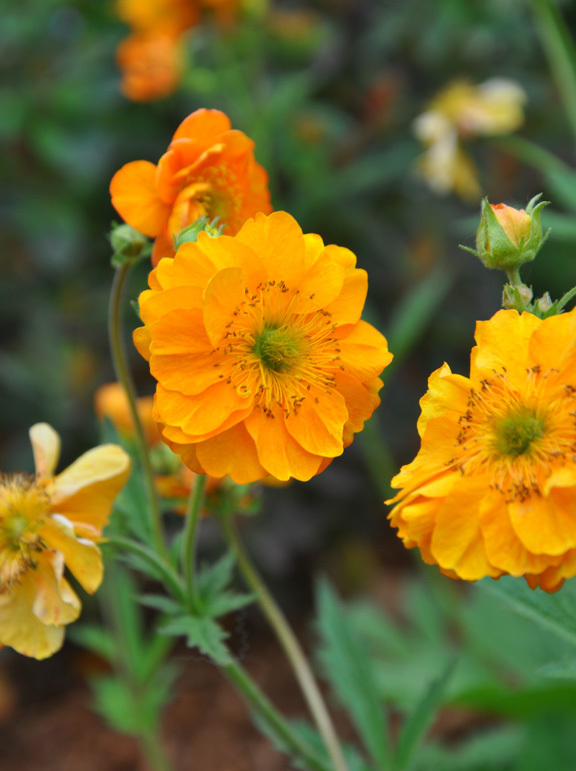 The peach flowers of the Geum emphasize the burnt-orangy-red (yellow when fully open) flower-like bracts of the Euphorbia. Looking at the combination in the opposite direction from the previous image. 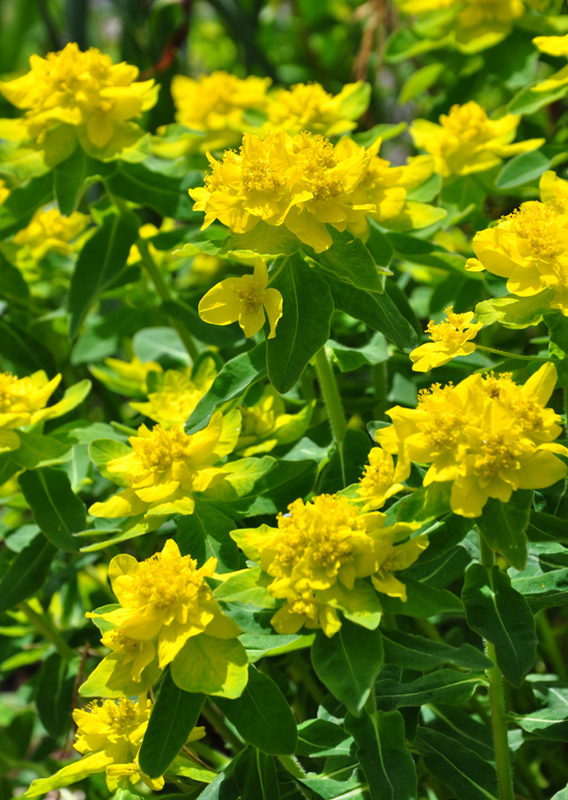 Euphorbia polychroma 'Bonfire' has green foliage when it first emerges from the ground. The leaves quickly turns into a mix of burgundy and green. The "flowers" are actually bright orange and yellow bracts. In fall, the deep burgundy color seems to intensify and the plant becomes magical when covered with frost crystals. Full sun and normal or sandy, dry soil. This Euphorbia also has a milky sap that is irritating to skin, so it's a good idea to wear gloves when you are doing any pruning. Height: 25-30 cm ( 10-12 inches), Spread: 30-45 cm (12-18 inches). USDA Zones: 5-9. Geum 'Mai Tai' forms a low mound of course green leaves. In early spring, soft apricot flowers are carried on tall branching stems. 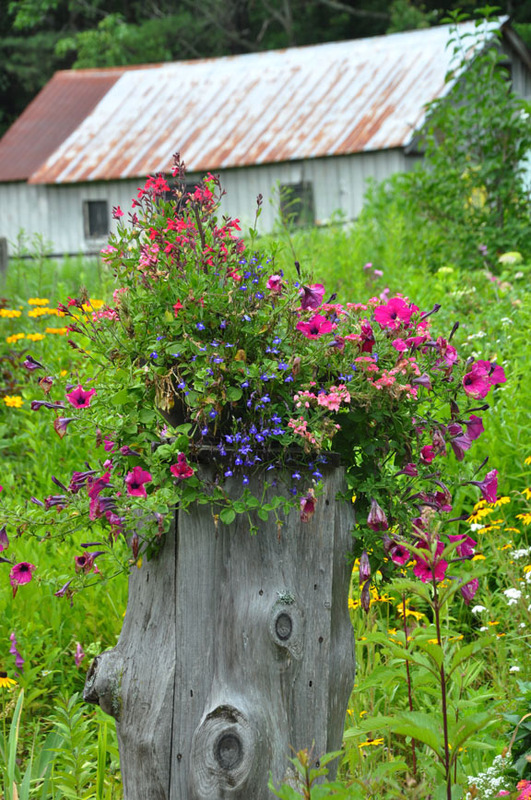 Removing faded flowers will encourage new buds. A hard pruning after the plant finishes flowering will also refresh the foliage. Divide in fall. 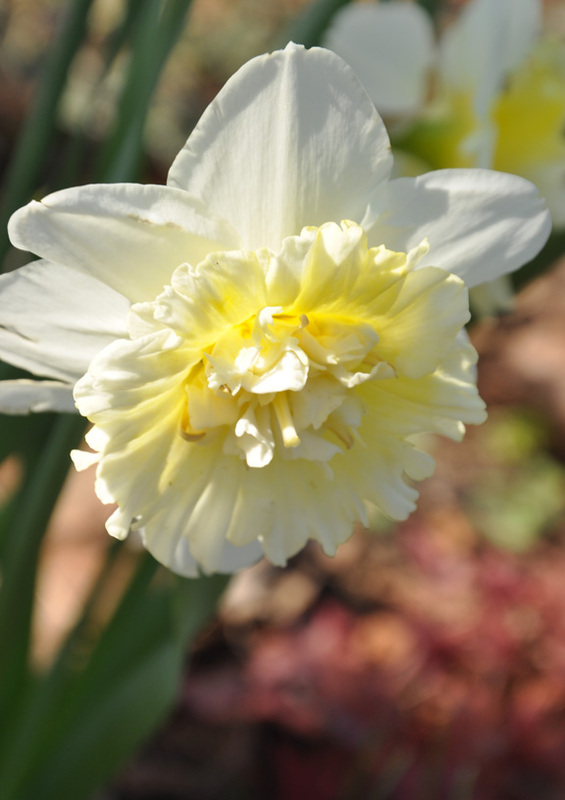 Average garden soil and moisture conditions will work for this plant. Height: 40-45 cm (16-18 inches), Spread: 30-35 cm ( 12-14 inches). USDA zones: 5-9. Bleeding Heart, Dicentra spectabilis is an old-fashioned shade garden perennial that shines in spring. The pretty, almost fern-like foliage of Bleeding Heart appears in late April/early May and lasts well into mid-to-late-summer, when hot, dry summer conditions send the plant into dormancy. By then their fading foliage is usually hidden by other plants. 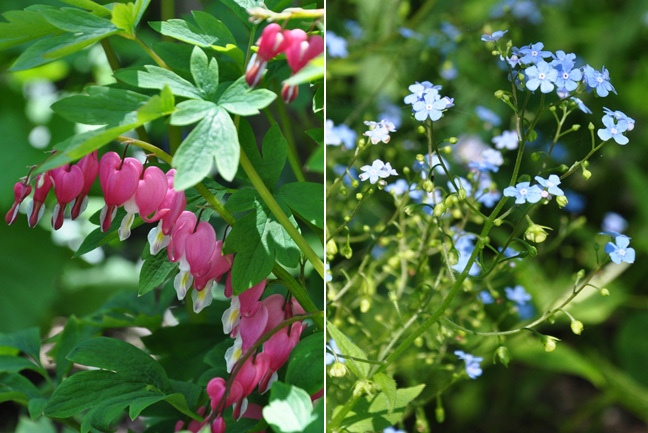 The dangling heart-shaped flowers are a charming bonus and last into early June in my garden. With its striking golden foliage and reddish stems Dicentra spectabilis, 'Gold Heart' is one of the nicest Bleeding Heart cultivars available. As you can see from the image below, 'Gold Heart' is a good-sized, bushy plant. Dicentra spectabilis, 'Gold Heart' tucked in behind a hosta in a private garden in Mississauga, ON. Design Trick: Mix warm colors together. Reds, oranges and yellows have an intensity and energy unmatched by cooler colors. 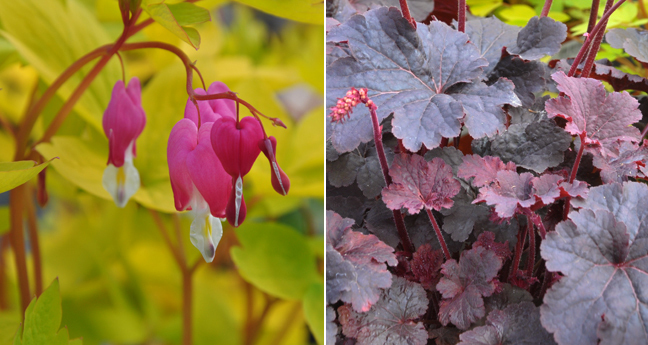 One nice way to play up Gold Heart's color is to plant it with a Heuchera, another shade plant whose foliage is just as striking. Heuchera seems to be the darling of plant breeders these days, so there are an abundance of cultivars to choose from when it comes to creating a plant combination with a Bleeding Heart. I'll mention just two of the many possible options. 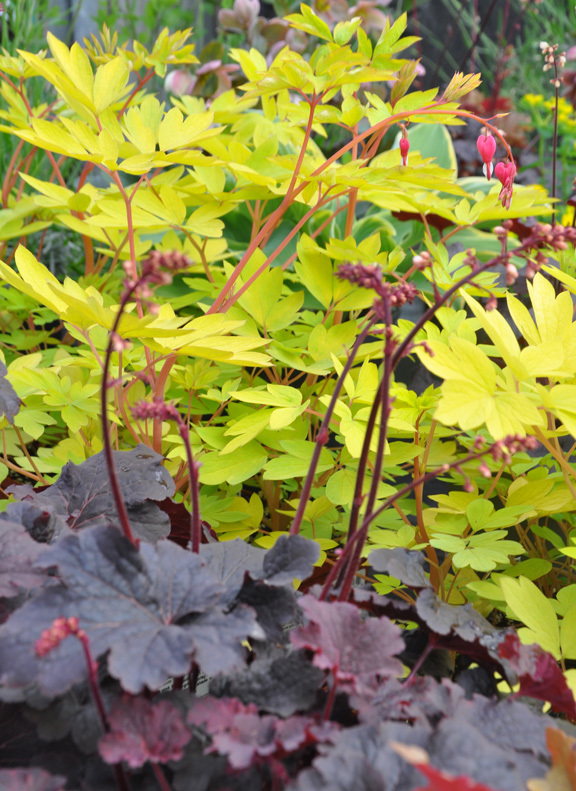 The mix of dark maroon Heuchera 'Cajun Fire' and 'Gold Heart' are a great example of two warm colors working in harmony. The reddish-brown foliage of Cajun Fire' also emphasizes the Bleeding Heart's arching magenta stems. Heuchera is a little slower to emerge in the spring, so the combination of the two plants should kick-in nicely just as the flowers of 'Gold Heart' start to fade. Heuchera is a smaller, more tightly mounded perennial than a Bleeding Heart, so plant a Heuchera to the front of a Bleeding Heart. Bleeding Heart, Dicentra spectabilis, 'Gold Heart' has amazing golden foliage with reddish stems. The heart-shaped flowers are magenta. 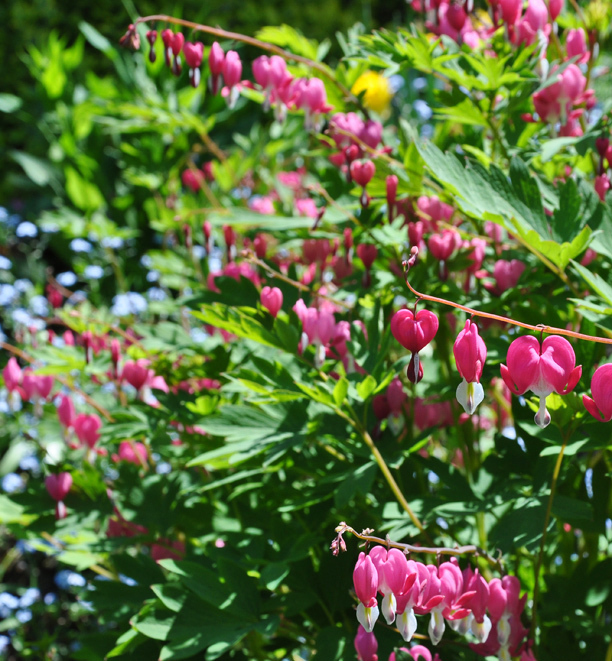 Bleeding Heart likes average to moist soil. Part or full shade. Height: 60-90 cm (23-35 inches), Spread: 60-90 cm (23-35 inches). USDA zones: 2-9. Heuchera 'Cajun Fire' has lobed foliage that is red in spring, turns black in summer and is maroon in the fall. The bell-shaped flowers are white. Part shade. Height: 25-30 cm (10-12 inches), Spread: 25-30 cm (10-12 inches). USDA zones: 4-9. This combination with the peachy-magenta colored foliage of Heuchera 'Marmalade' is a similar combination of warm colors. 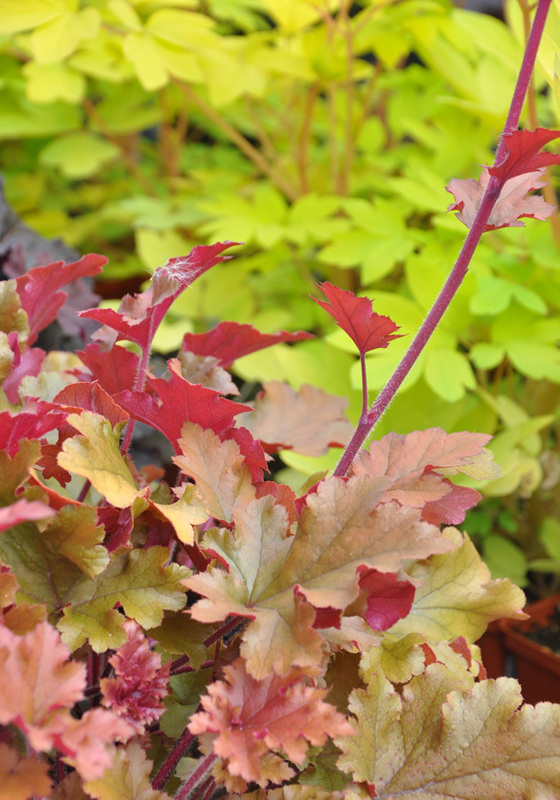 Heuchera 'Marmalade' has foliage that varies in color from peachy-bronze to magenta. The tall flower sprays are brownish in color. 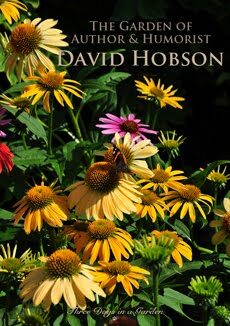 Average garden soil and moisture conditions should be fine for this perennial. Part shade. Height: 25-40 cm (10-16 inches), Spread: 30-45 cm (12-18 inches). USDA zones: 4-9. Design Trick: Another way to make a nice plant pairing is to pick a color from one plant and find a another plant with that same color. 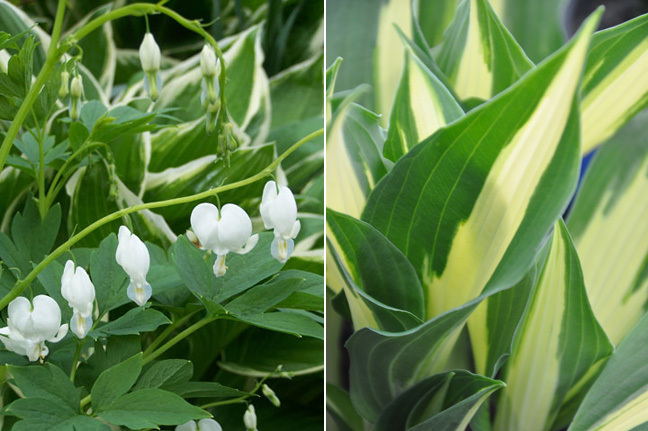 The delicate white flowers of Bleeding Heart, Dicentra spectabilis, 'Alba' works nicely with a hosta variegated with creamy white. Bleeding Heart, Dicentra spectabilis, 'Alba' has bright green foliage and white flowers. Height: 70-90 cm (27-35 inches), Spread: 70-90 cm (27-35 inches). Light shade to full shade. Average to moist soil. Hardy: Zones 2-9. Hosta 'Night Before Christmas' has foliage with creamy-white centres and green margins. Pale lavender flowers appear in July or August. Part to full shade. Height: 40-45 cm (16-18 inches), Spread: 85-90 cm (33-35 inches ). USDA zones: 2-9. Design Trick: The idea behind this combination is simple: balance a hot color (pink in this case) with a cool color (blue). Common Bleeding Heart, Dicentra spectabilis takes a few years to come into its own, but when it does, Dicentra spectabilis forms a generous mound of fresh green foliage. You can refresh the plant after it flowers by cutting it to 6" above the ground, but even so, it will go dormant by late summer. Light to full shade. Height: 70-90 cm, Spread: 70-90 cm. Average to moist soil. USDA Zones 2-9. Forget-me-not, Myosotis alpestris: please see the notes on Forget-me-nots at the beginning of the post. 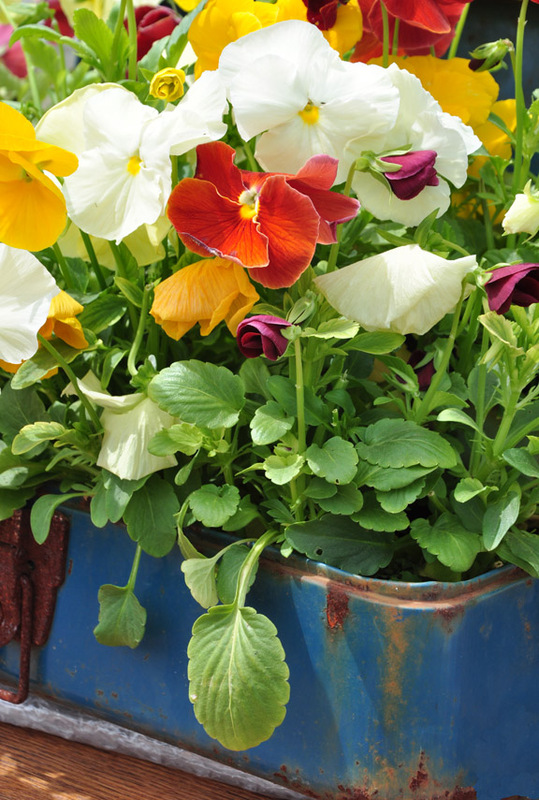 Do you have a favourite spring plant combination? Please share it! So often the creative side of gardening is overshadowed by the more practical aspects of planting and nurturing flowers, fruits and vegetables.It's important to remember that gardening is not just work, it can be fun and inventive as well. 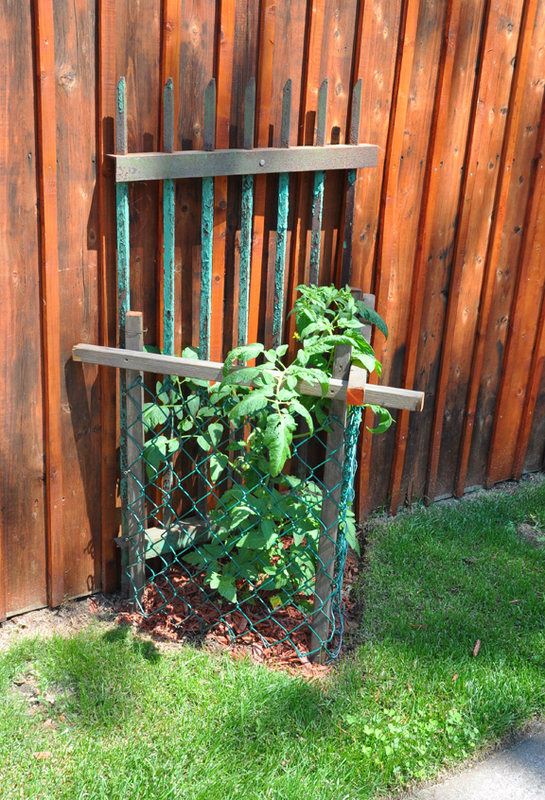 Gardeners can be a resourceful lot. They look around them to the materials at hand and see a creative potential. This post celebrates different ways to add whimsical or rustic touches to a garden using found objects and materials. Some of these ideas make use of natural items such as twigs, branches and tree stumps in a host of clever and unique ways. In other examples, everyday objects and industrial materials, like metal, have been re-imagined and given a second life. Even in death and decay, nature has an eerie beauty. Trees, with their twisted and gnarled roots, retain some of their majesty and grandeur even in death. 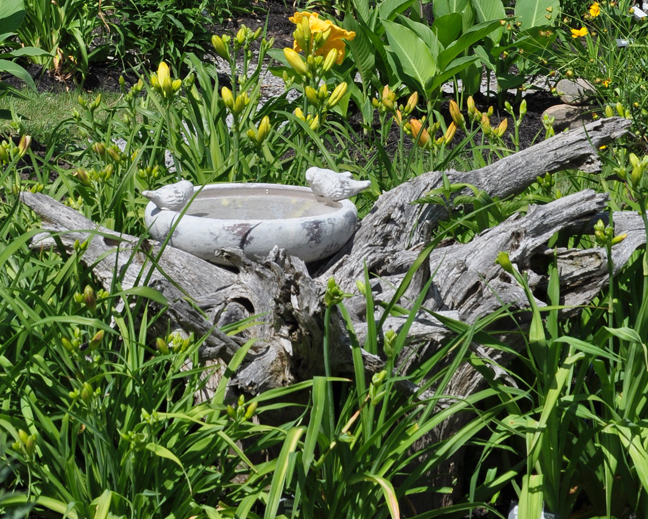 Not surprisingly then, there is an old tradition of using tree stumps in a garden. 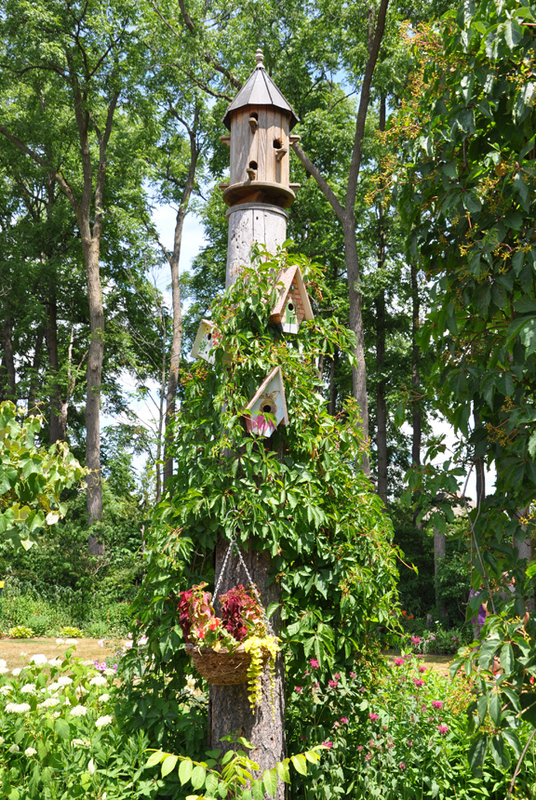 The first known "stumpery" was created in the 1850's by Edward William Cooke, an artistic gardener working on a large estate garden. In a flash of inspiration, Cooke saw a fresh use for tree stumps that had been unearthed when a section of the Batemen estate was cleared. Cooke piled the roots of these trees into a wall of stumps and then interplanted them with ferns. Very quickly the Batemen estate became known for its "stumpery." The delicate beauty of the green ferns emerging from the decaying wood was not only strikingly beautiful, it was a reminder, on a more spiritual level, that life can spring from death. 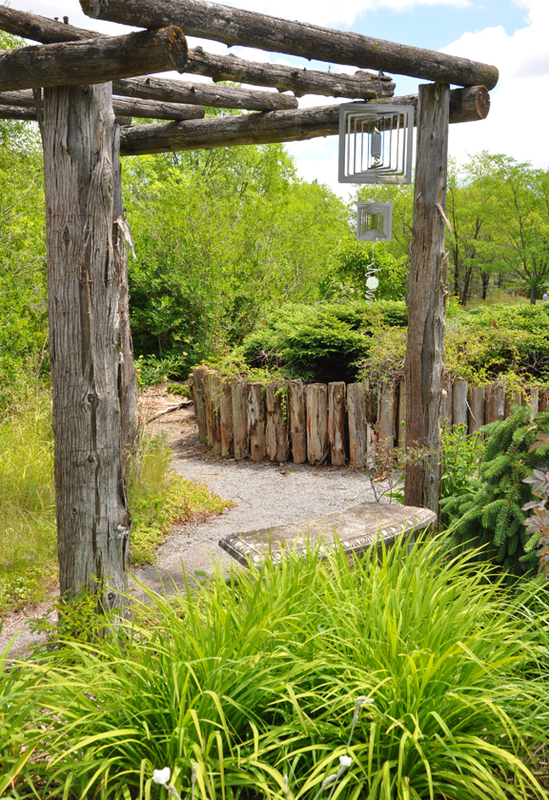 A modern stumpery that includes clay pots. 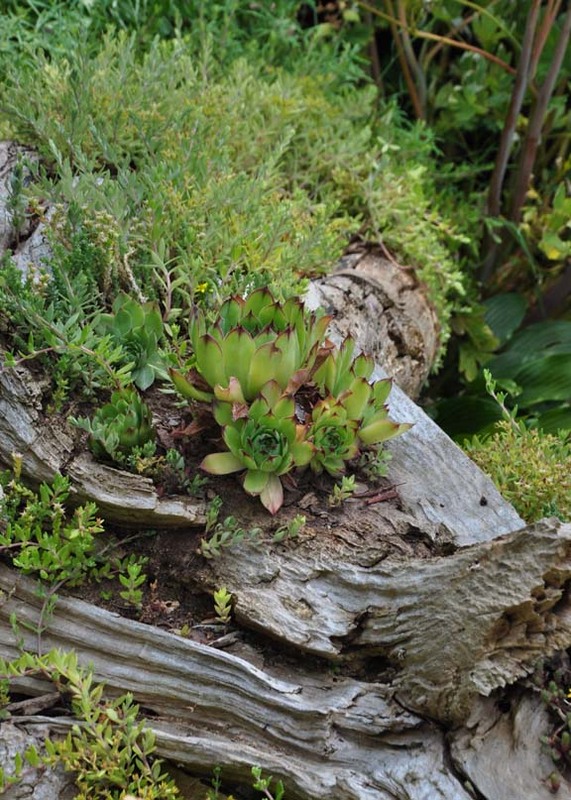 Making a garden stumpery grew to become a fashionable way to creat the perfect habitat for hardy ferns. 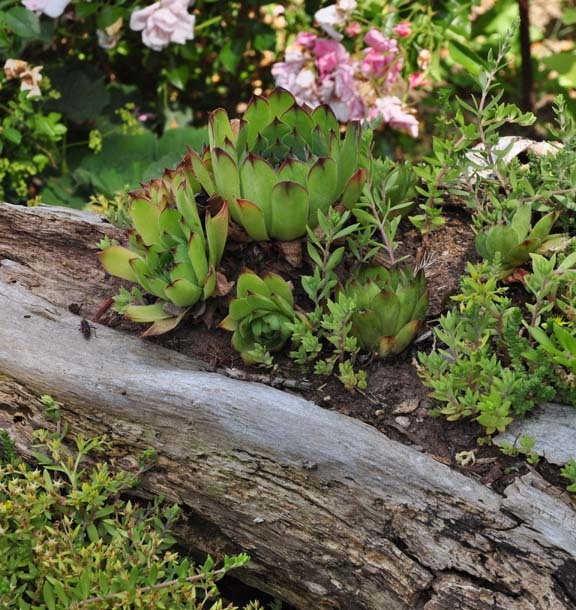 Decaying wood returns nutrients to the soil providing the perfect rich, loamy environment that these woodland plants love. At present stumperies are enjoying a resurgence in popularity do, in large part, to the efforts of Prince Charles who created a stumpery at his home at Highgrove House. In this instance, the Prince used sweet chestnut roots to create a shade garden filled with a large collection of hosta, ferns and hellebores. 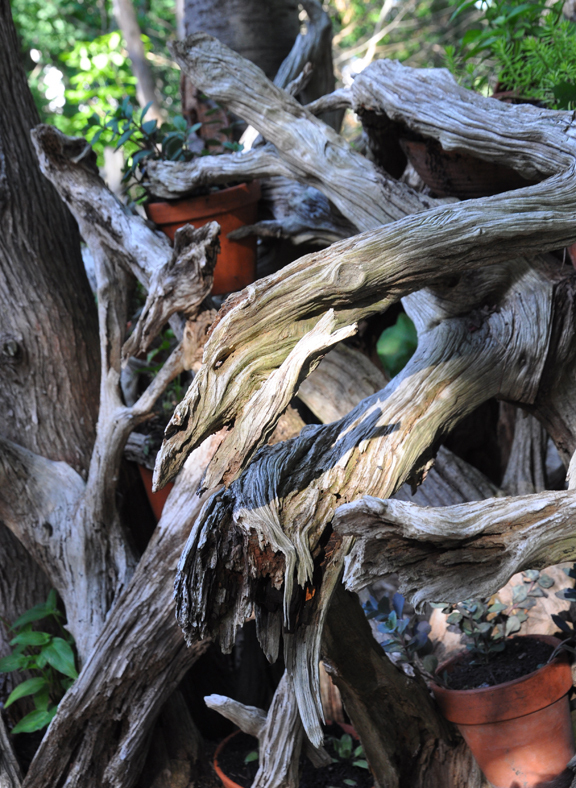 The dramatic architecture of a tree's roots is more than just an ideal home for plants. Their mysterious and somewhat melancholy aesthetic can suggest a spiritual significance. One of the most dramatic examples I have seen is in the picture above. 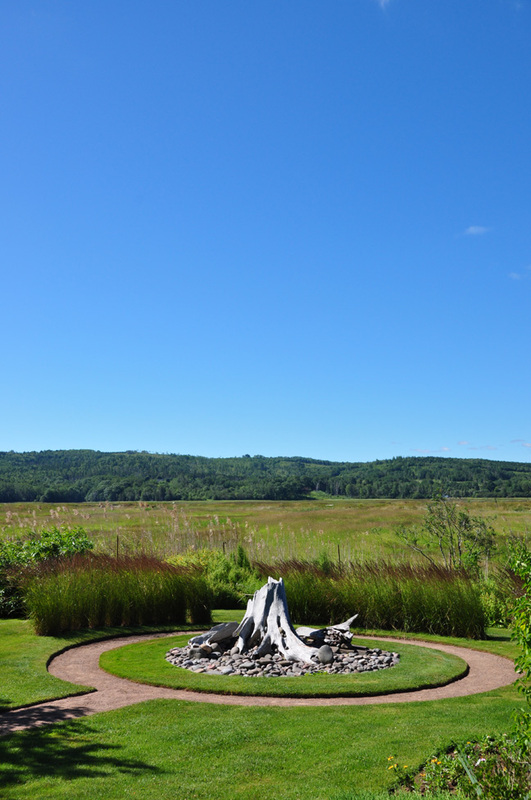 The stunning view is a reminder of nature's beauty and the ring that surrounds the large silvery-grey tree stump is a reference to the circle of life. 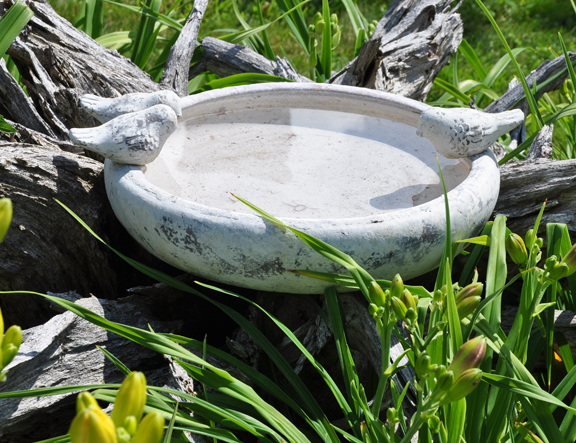 Tree stumps and driftwood can have modern uses as well. 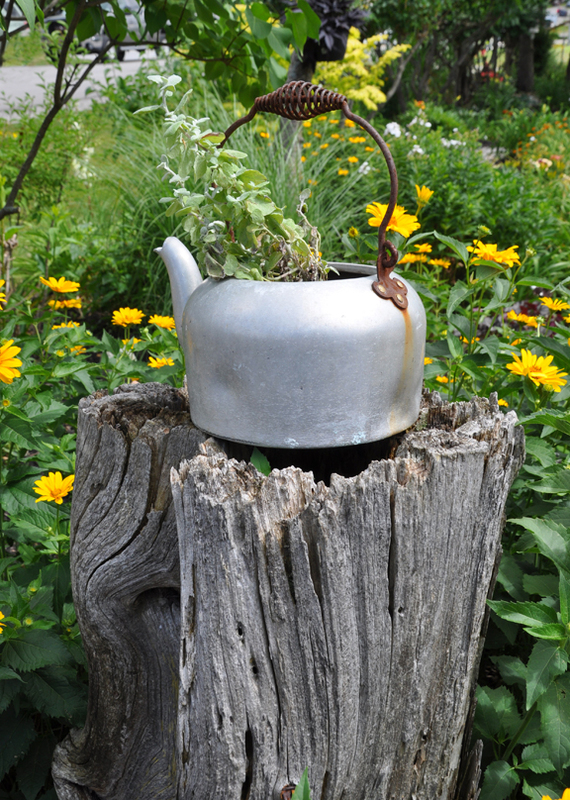 The only limitation is a gardener's imagination. Here on the edge of a pond (above) a weathered bit of wood suspends lanterns over the water. 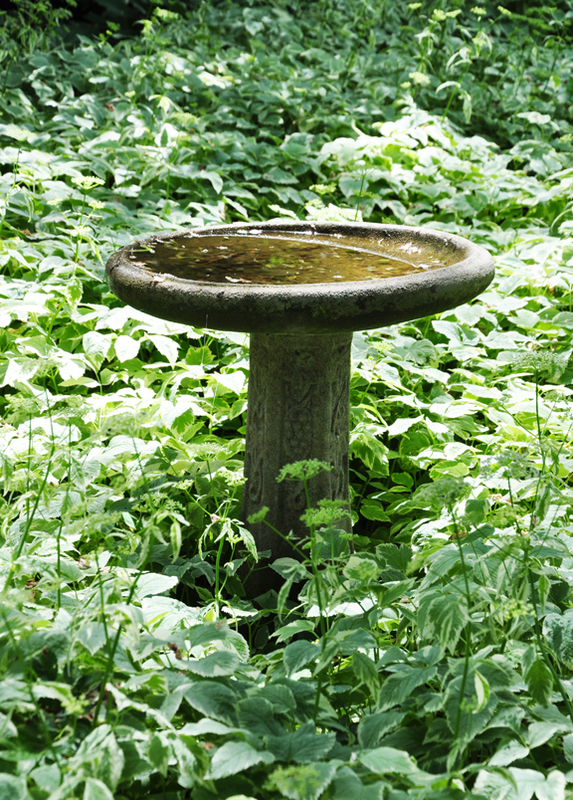 In the image below, a birdbath is nestled in the centre of a large, inverted stump that has been aged by the elements. 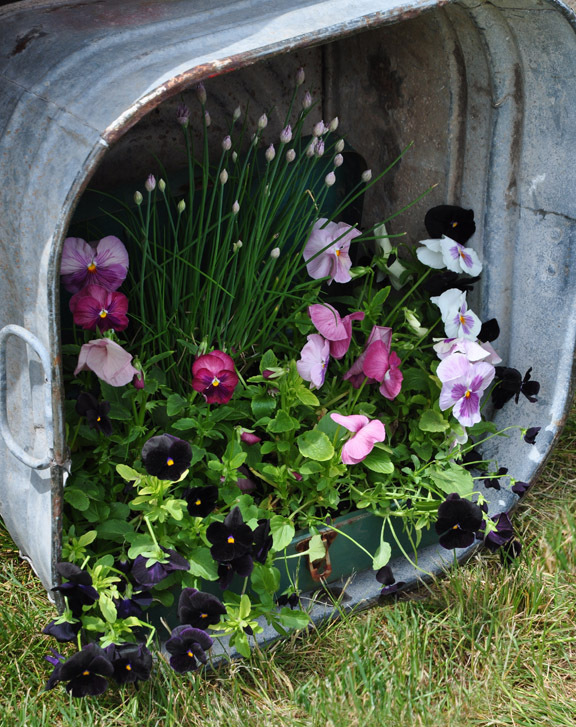 or a pot filled with flowers. A dead tree trunk can also make a tall apartment building for birds. Logs and tree branches can find architectural uses as well. These rough wooden structures can sometimes have a large, imposing scale. 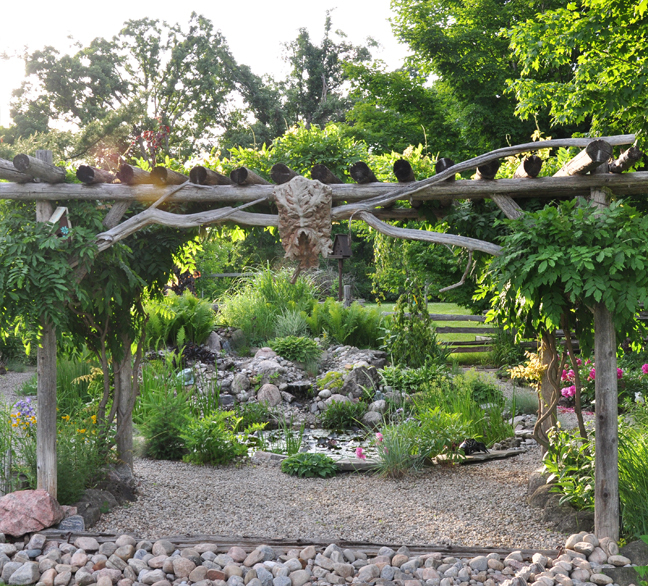 There is something about this pergola that makes me think of Stonehenge. 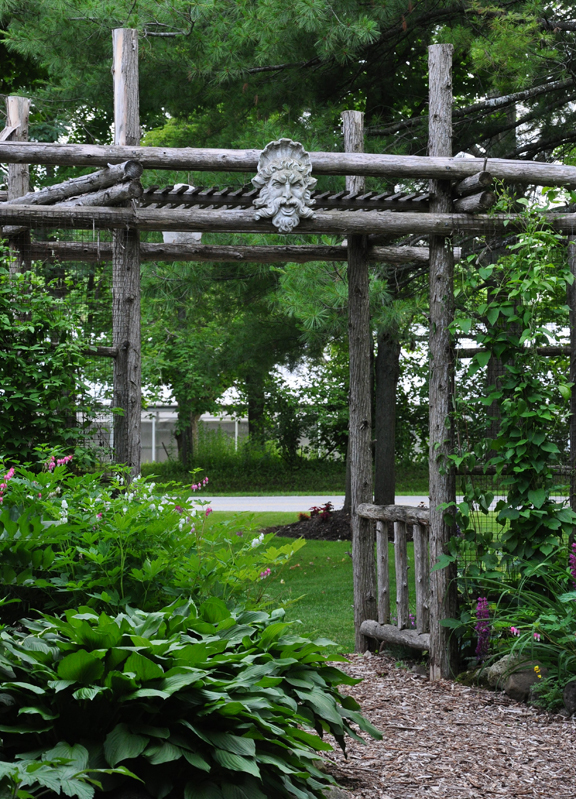 The face that presides over this arbor again makes reference to that other worldly quality of rough, unfinished wood. In this example and the next, the faces reference fantastical creatures and the world of myths and legends. Young saplings can be pliable. They can be bent into a curve or woven to make a fence or gate. 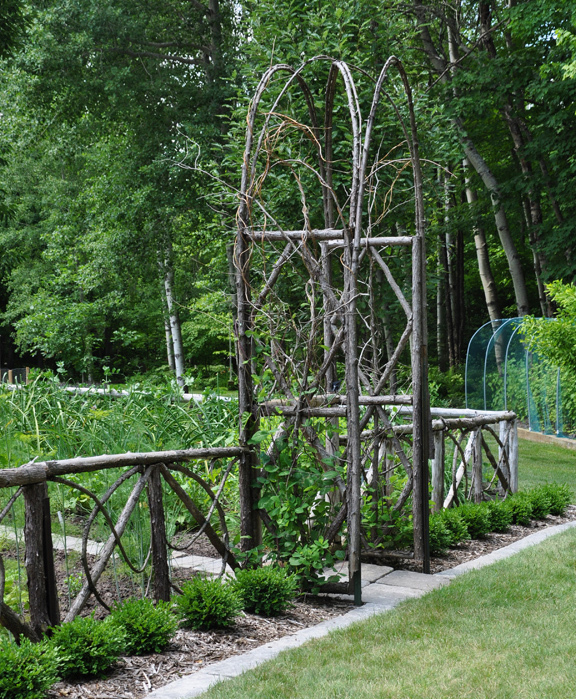 Here spruce saplings have been used to create a fence and arbor for this vegetable garden. 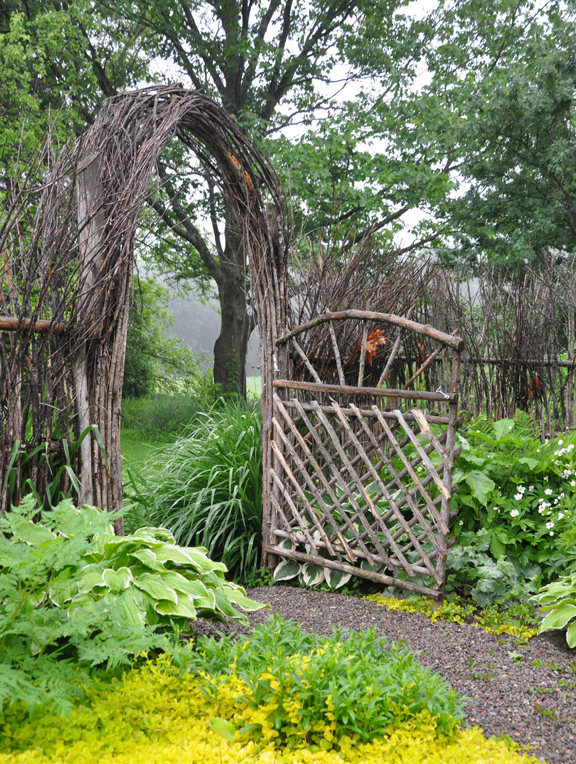 The tradition of making low woven fences for a vegetable or herb garden stretches back to Elizabethan times. 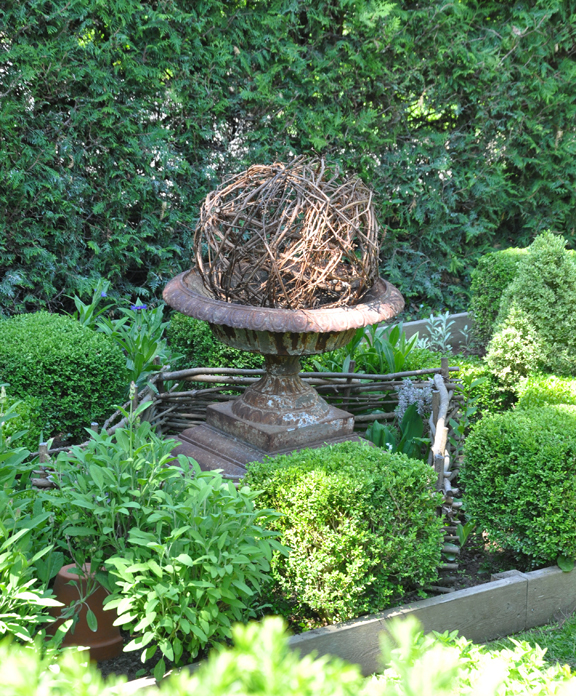 In this modern example, branches have been woven to make a frame for an urn that sits in the centre of a formal herb garden. 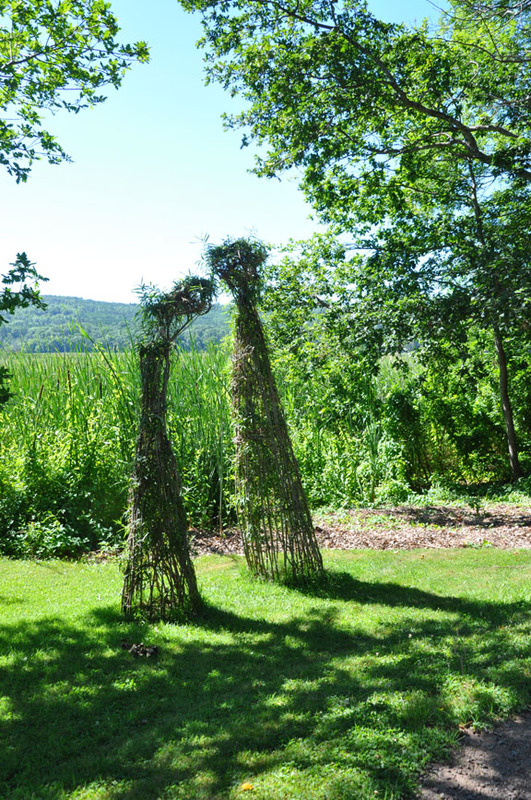 Willow is particularly pliable and is often used to make rustic furniture, structures and even abstract sculptural figures like the ones you see below. 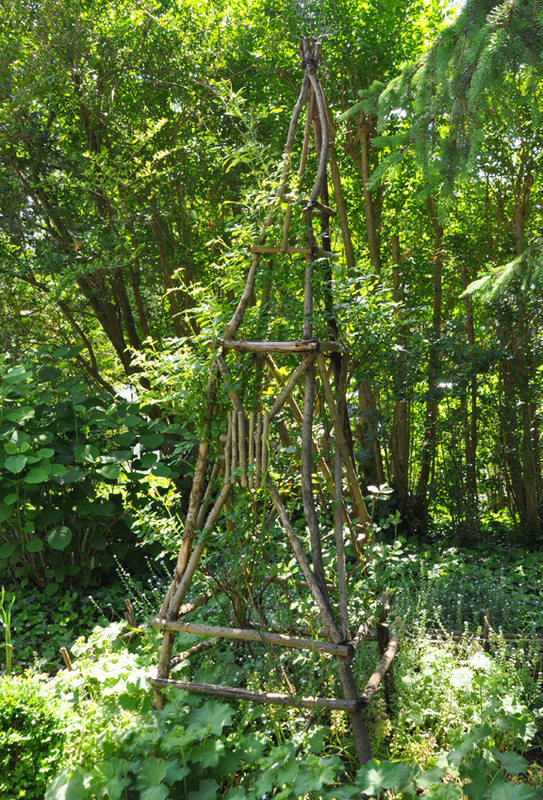 As well as more decorative uses, twigs can also be configured into an obelisk that provides support for climbing plants. 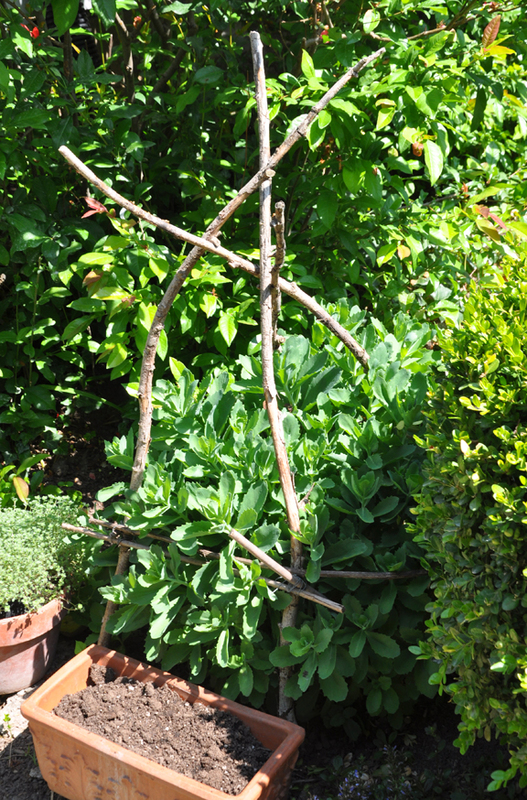 Even on a very basic level, twigs can make a very natural looking plant support. 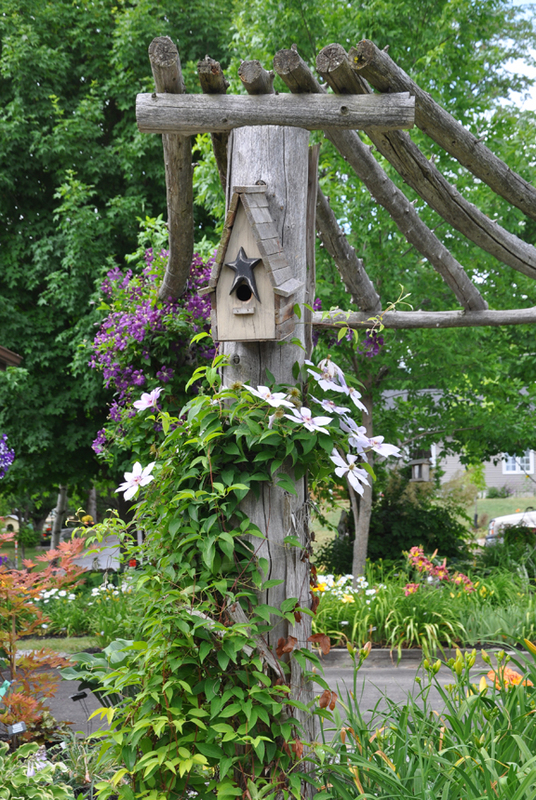 In this final example a mix of different branches and a upright log support a couple of different types of clematis. 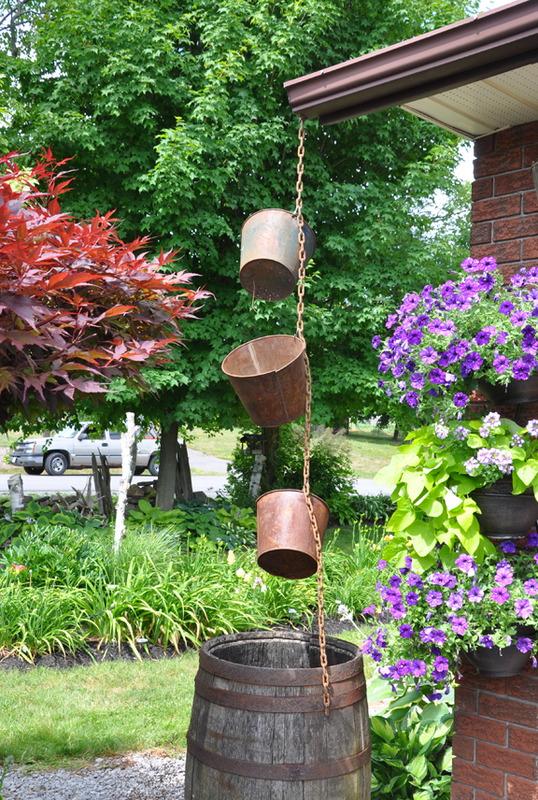 Aren't these metal buckets hung on a length of chain a rather whimsical way to channel rainfall? In the second part of this post, we will focus on ways everyday objects and industrial materials have been repurposed. 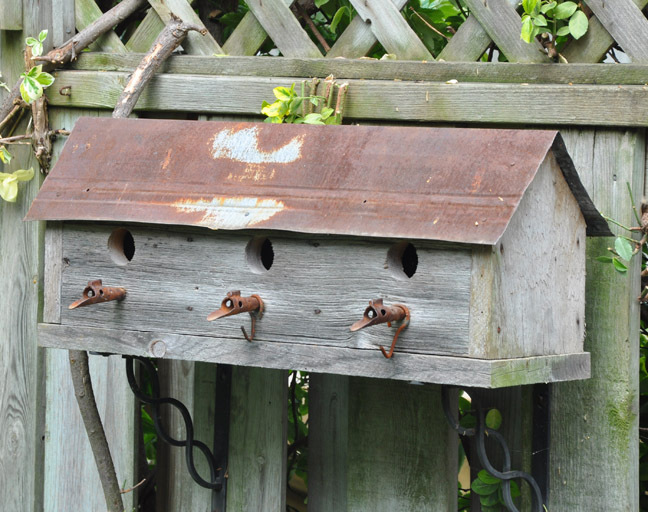 The roof of this long rectangular birdhouse is a old rusted piece of metal. 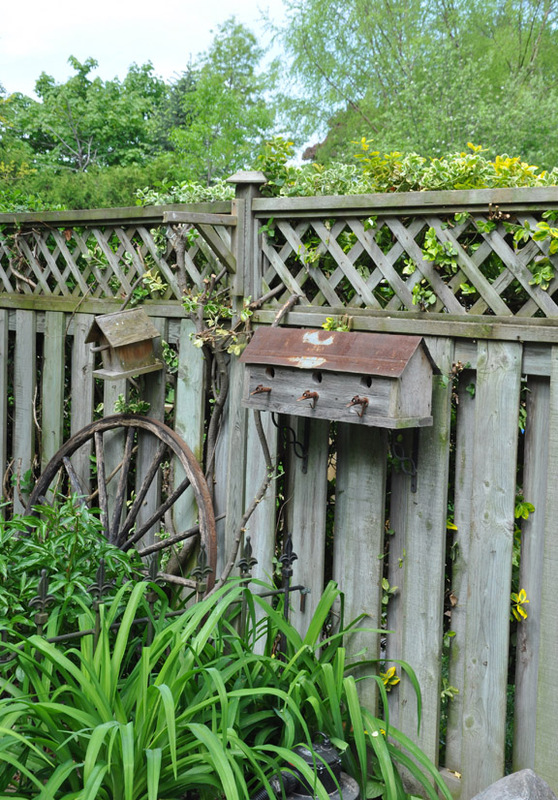 A row of maple syrup spigots provide a place for birds to land. Below the birdhouse, an old wagon wheel becomes a abstract sculptural object. 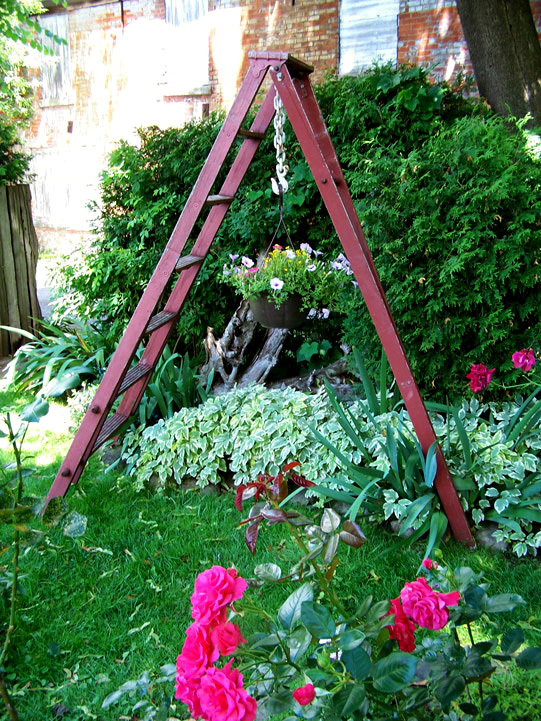 Ladders make terrific plant supports of one kind or another. A window with an nice patina can be used as an abstract architectural sculpture. 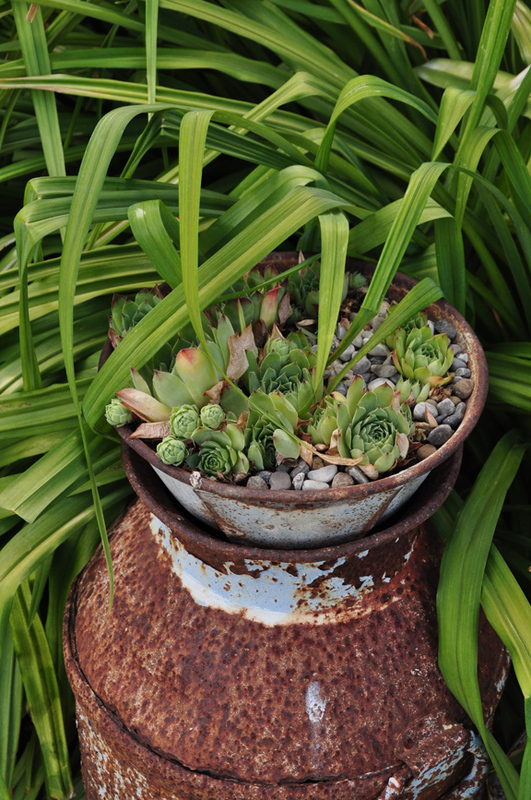 An old milk can makes a rustic container for a planting of succulents. 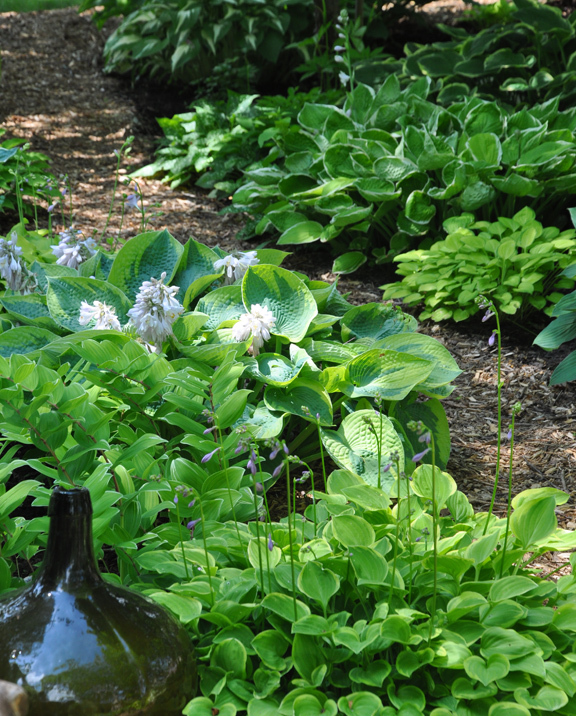 In this instance old bottles are have been scattered through a shade garden. This row of tomatoes are made more dramatic with a striking backdrop. The fence looks like it's rusted metal, doesn't it? But as you can from the closeup below, it is just a clever paint job on an ordinary wood fence. 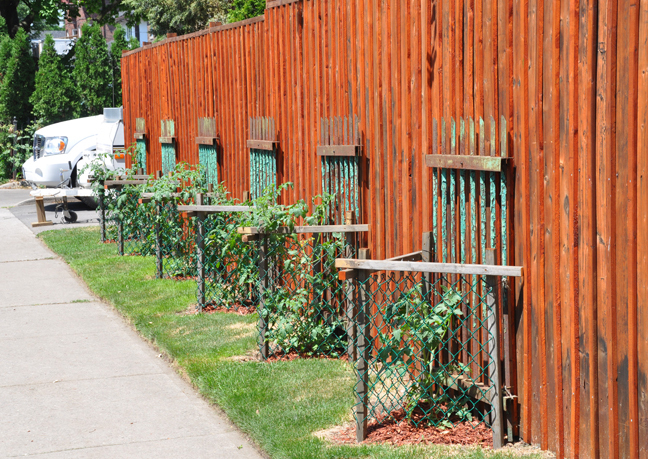 The oxidized metal stakes behind the tomatoes add to the effect. It seems fitting to end this post with a few spring container plantings. 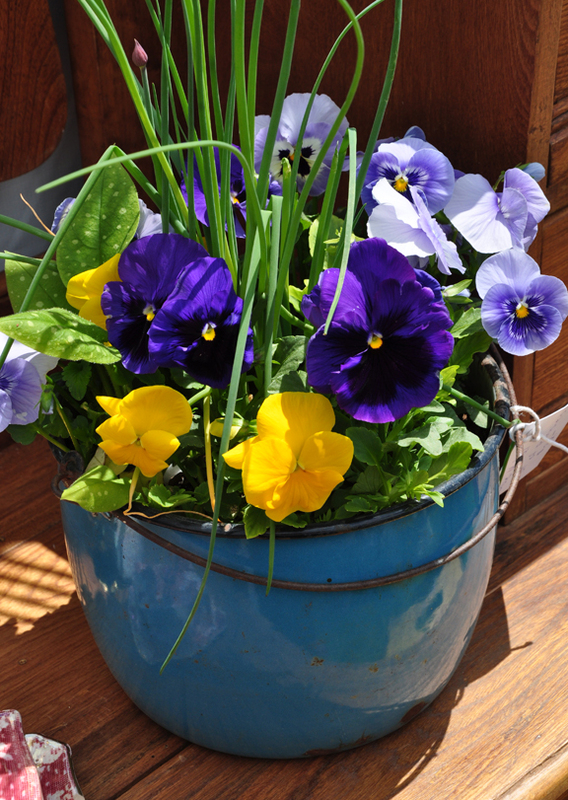 This first one makes use of an old blue pot. 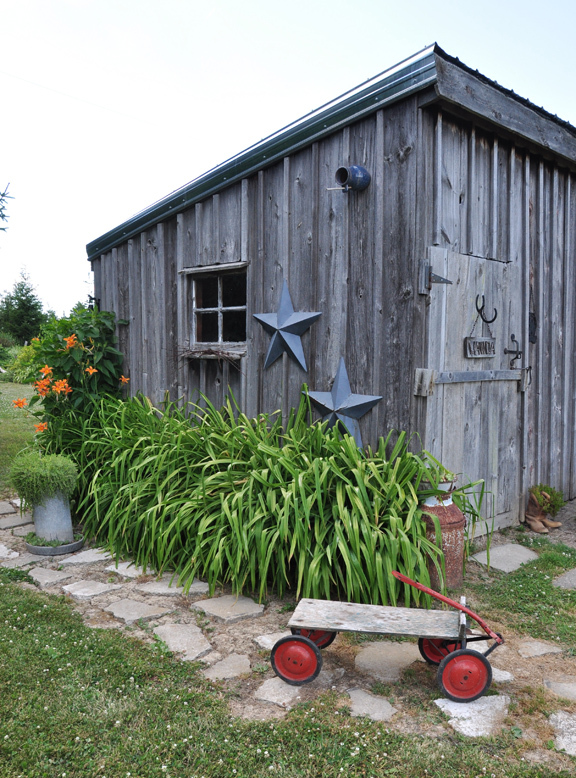 This is a re-imagined use for a rusty toolbox. 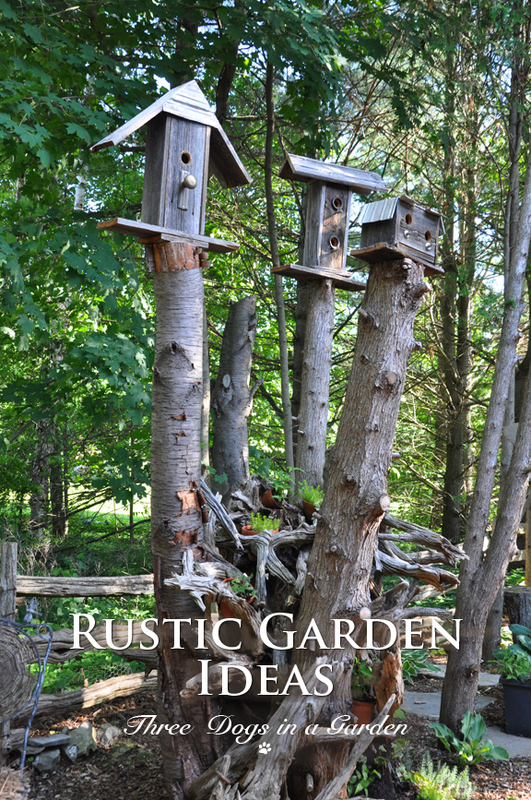 I hope this post will encourage you to get creative with found objects and natural materials. 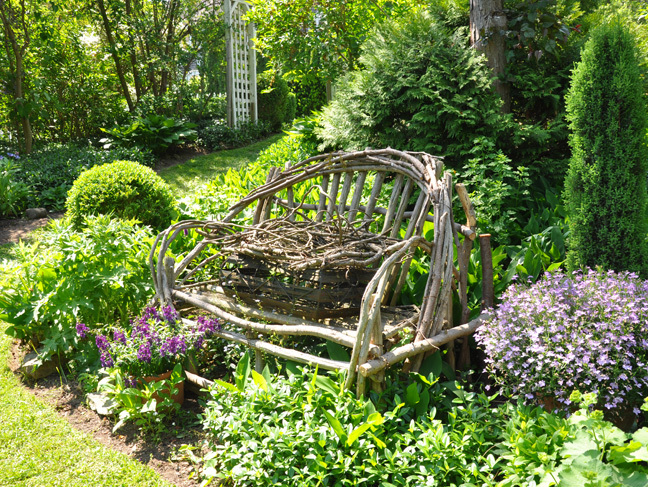 Remember, a garden is the perfect excuse for a grown-up to have fun express their imagination. A Garden to Dye For!